Around the same time it was announced former President Barack Obama and Michelle Obama had signed a joint $60 million book deal, former Vice-President Joe Biden and his wife Jill signed a book deal of their own. While the amount the Bidens received is not known, it is undoubtedly less than that of the Obamas, but it seems “middle-class Joe” may have found a way to make up some of the difference – charging those seeking an autographed copy hundreds of dollars for one. Biden is set to embark on a tour for his forthcoming book, “Promise Me, Dad.” The book details the death of his son Beau and his decision not to run for president in 2016. While most book tours include either a book signing or attendees receiving a copy of the book that was signed by the author beforehand, signed copies of Biden’s book will only be available to those who purchase VIP tickets to the event. 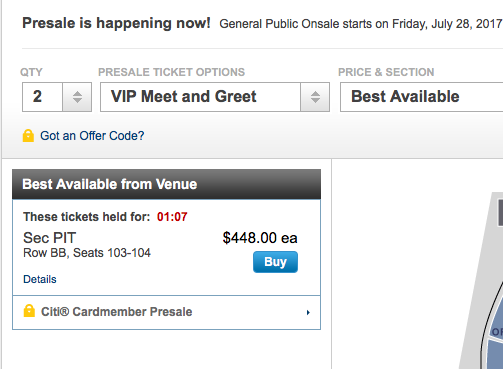 The price to meet Biden and get a signed copy of his book is $448, not including the service fee for tickets. Tickets for Biden’s event at the Lincoln Center in New York start at $76, which includes an unsigned copy of the book, and VIP packages for $446.50. In Portland, OR, the price ranges from $25 to attend to $325 for the VIP package. In Ann Arbor, Michigan, the range is $59 to $260. Residents of Austin, Texas, can pay up to $325 for the VIP treatment. 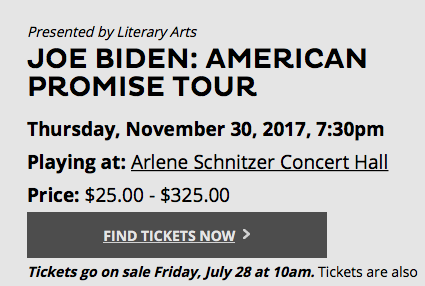 Tickets for Biden’s book tour have yet to go on sale, and some are code protected for pre-sale. Information about the tour can be found by clicking here.